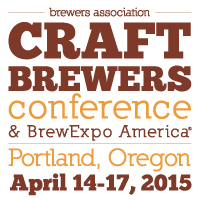 The Craft Brewers Conference (CBC) & BrewExpo America is coming to Portland, OR. This is the Detroit Auto Show for craft brewers, where industry leaders meet annually to exchange ideas and get educated on one of the countries most thriving industries. The estimated 11,000 attendees will be able to view over 500 exhibits, as well as 160 presenters on a range of brewing industry related topics. The CBC is an opportunity for the craft brewing community to share ideas and learn from one another. It is no surprise that Portland has been chosen to hose the conference this year because of its nationally recognized dedication to craft beer. BrewExpo America is the trade-show portion where nearly 500 vendors bring their latest offering to exhibit for the brewing industry. Big and small alike everything from tank manufactures to yeast labs will be in attendance. The Craft Brewers Conference will run from Tuesday April 14th to Friday April 17th and BrewExpo America will be the 15th until the 17th. The Brewers Association is a not-for-profit trade association that is dedicated to small and independent american brewers that represents more than 70% of the brewing industry.